Should federal judges and Supreme Court justices have term limits? What does it mean to be qualified to be a Supreme Court justice? What does “good behavior” mean? Once they are appointed, federal judges remain in office during “good behavior.” In effect, most federal judges serve a life term (since the Constitution does not state a time limit or number of years). Who is Brett Kavanaugh? How do concerns about his nomination affect the process? What is the role of the media? What is civic duty? Was it displayed in the Kavanaugh hearings? What role does the Senate play in confirmation hearings for a Supreme Court justice? What are the rules of the Senate with regard to confirmation hearings? What are the options to interview a potential justice? How does this resemble a job interview? What questions and answers are most helpful? What is the responsibility of the Senate Judiciary Committee? 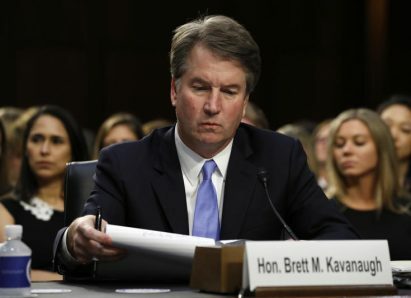 What is “fair process” in handling accusations against a Supreme Court nominee? How do partisan divisions in the Senate and throughout our government affect nomination hearings and confirmation of a Supreme Court Justice nominee? How could the hearings process be less divisive? What role will an investigation by the FBI play? Will a decision be easier after such an investigation? What does a week delay mean to the process? What does it take to be a judge? Is there such a thing as judicial temperament? Is this nomination interwoven with the “Me Too” movement? Are women significant to the way the Senate works? +Are the women in the Senate playing an important role in resolving this issue? What did the choice of a women prosecutor to ask questions mean? Are women throughout the country playing an important role? Is this more than a man/women conflict? Is this a question about the viability of our system of government? What is the selection and confirmation process for judges in Oregon? Why is this nomination to the Supreme Court and the hearing process an important landmark on the road to a healthy thriving democracy? Should juvenile bad choices affect decisions about adults seeking judgeships or other positions? Unit 4, Lesson 25: What Is the Role of the Supreme Court in the American Constitutional System?